Every now and again I hit a patch where I find myself feeling irritated by to noise. On particularly bad days I wince when the children are playing exuberantly, and Husband is playing music, or the television is on. Sometimes even the visual noise on the internet can be too much. All I want to do is crawl into my bedroom, shut the door, curl into a little ball and lose myself in a book. I’m aware that sensitivity to noise is a symptom of a range of medical conditions (before you flood me with comments diagnosing me with one or another of them). In my case it’s not so much a physical sensitivity - I don’t get headaches or tinnitus, it’s more just a noise fatigue. Pain can take 1-2 units, poor sleep can too. Helping others can take away 1-2 units of energy. When energy levels <5 everything is harder to deal with. Noises are too loud, there's too much going on around you, you're moving slower. At 4 units of energy stop and take a nap. At this point you really can't function all that well, you trip over your feet easily, have trouble talking, your memory is poor. It will take 2-3 times as long to recover at this point than it took you to get here. I need to slow down, take things a bit more quietly, make sure I have time to look after me. Run that hot bath and have a soak in it. Curl up with that book. Take some iron supplements. Sip some chamomile tea. Practise some silent, meditative prayer. I’ll be back to my “normal” self in about a week. I wasn’t too surprised the first time that I got a comment from a coin trader. They’d presumably stumbled upon my post when searching for possible sales or purchases, but then read and made an appropriate comment. More recently, I got a comment from a different coin trader asking to see the copper coins in question. I was surprised they’d completely missed the point of my post – the coins in my case were a metaphor. I related this story during the bloggers conference, then in the process of telling the story, I realised that the others didn’t know the reference to the widow’s offering either. I had forgotten that not everyone reading this blog has read the Bible for as many years as I have. The stories I grew up with in Bible in Schools classes are no longer common knowledge. I apologise now to my readers for my assumption that you all knew what I was talking about in my Faith posts. I’ve also been at the other end of this, when I was trying to follow a theological discussion that mostly seemed to involve lots of long words ending in –ism and –ology and acronyms of Jargonese. I got lost very quickly. The challenge for me is to balance my “Faith” posts between those readers who are even better qualified than I am to write about faith, and those readers who have no Christian background, but are still interested in this part of my life (otherwise they aren’t reading these posts anyway). Good theology should be easy to explain and understand, and also be real and relevant to daily life. Does this make sense? Do I actually understand what’s being said or is it some academic waffle that’s over my head? Does it line up with what theology I already understand? Do I agree? Often this is a subjective, gut level feeling. Sometimes very reasonable sounding arguments just feel wrong. Experience has taught me to trust my instincts. So what? How is this relevant? There are discussions out there in the Christian world today that have about as much relevance to how the ordinary believer lives out his or her faith as the supposed medieval discussion about angels dancing on a pinhead. When I write about my faith I want to be thinking and writing about the “So what?” How do I personally apply my faith in my daily life as a spouse, parent, employee, friend and neighbour? I hope this gives me something to say that’s relevant to all my readers. I pray that what I write is helpful and meaningful to you in your life and faith journey. I’m a wife, a mother of three children and the main bread-winner for our family. All you who are also Mums will know how hectic that can get, and how hard it can be to find time for yourself, let alone any kind of spiritual life. I’m also an average, normal Christian. 17 year olds do tend to be idealistic, but this is still the standard I measure myself against. When I look back over the years (ahem) decades since I wrote this, I can see that while I’ve made good progress, I also have a long way to grow. This coming Sunday is the Christian celebration of Pentecost. The story of Pentecost is about the empowering of God’s Spirit. It’s about a group of (mostly) uneducated disciples, that were transformed to speak with courage and wisdom. Peter, who only a few short weeks ago had denied Jesus in fear, now preached boldly, standing up to the religious leaders of the day. And three thousand people were added to the believers in one day. They went on to lead vastly different lives from what any of them had imagined. I need that kind of empowering in my daily life too. I need to make the space to breathe in God’s presence, to encounter the Spirit afresh. How do you make space for God’s Spirit? I was a cute baby, even if I do say so myself. 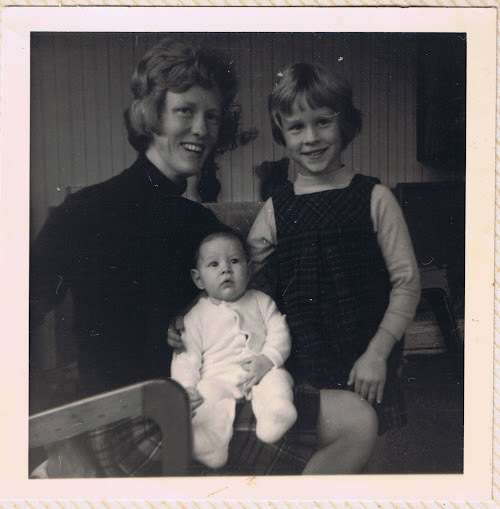 My Mum, my Big Sister and Me. Sometime in the 1970’s. The irony is that Mum is very unlikely to read this. My parents don’t have internet, and aren’t interested (yet) in getting it. Not that we ever paid much attention to Mothers’ Day and Fathers’ Day when we were growing up. Too commercial for my parents’ liking. Besides, Dad’s birthday is early May and Mum’s birthday is late August, so it made sense to make more of a deal out of the birthdays. If I can do nearly as good a job raising my children as my mother did raising us, then I’ll be doing pretty well. Just before Christmas I compiled a list of my favourite 20 Christian books. I included a newly published book I considered a potential “classic”. @ivpress @adulcia Okay, it was #8, but I was so excited I apparently blinked at the wrong moment. "Slow down," I thought, "It's just lil' ol' me!" I'd never have imagined a book review (unsolicited and un-sponsored) on my blog would lead to an international skype call between my study group and the author. (Thank you so much, Gary, for being willing to sacrifice your sleep at 2:30am to meet with us). Sometimes the unimaginable happens in the blog-iverse. God's kingdom knows neither geographic boundaries nor time-zones. Unlike nearly every other book about prayer I've read, Gary doesn't write about what he thinks prayer should be, instead he points the reader in the direction of historical "Giants" such as Benedict of Nursia, Augustine of Hippo, John Calvin, Ignatius of Loyola, Teresa of Avila and Andrew Murray, and several others. Gary provides very practical guidelines for putting each tradition of prayer into practice. This is what makes Kneeling with Giants such a powerful resource. It's not the book itself, the book just points the way. It was in the actual praying and entering the very presence of God that I found myself glimpsing depths I'd previously only lightly touched the surface of. Our study group has now reached the end of the book (Gary, you can tell your son we have now read all the words!) but I feel I want to go back again and again to these prayer traditions. I will certainly be spending more time with Teresa of Avila, the Puritans and the anonymous medieval author of The Cloud of Unknowing, among others. My journey into prayer has barely begun. Who wants to come along with me? Despite my best efforts at self-education, I find a lot of theological debate is simply over my head. I gave up trying to read some of the more intellectual Christian blogs because I could not understand 9 words out of 10. (I have no idea whether I’m supposed to agree with Calvinism or Arminianism – or even if I actually understand what the difference is between them.) I alternate between thinking I just lack the necessary education (C.S. Lewis was not a theologian either, and the nearly 1000 sermons I’ve heard over the last couple of decades are not the equivalent of a Divinity degree), and thinking my brain just isn’t wired in the right way and I should just stick to what I’m good at (like understanding the New Zealand Income Tax Act). I read with interest this week the friendly lively discussion mutual accusations of heresy respectful debate between the Reverends Bosco Peters and Peter Carrell. These are two Anglican bloggers that generally strike me as being down-to-earth and relevant. What I took from this debate was not a deeper understanding of the topic, but an impression of how far behind they were leaving me. I think Bosco was trying to make a point about how the average person understood a particular phrase, compared with a theologically trained listener. That point seemed somewhat lost in the ensuing discussion about what the phrase in question actually should or did mean. It was miles over my head. I consider myself a mature, experienced Christian, who has benefitted from a great number of sermons from respected and well qualified theologians. However I still sometimes struggle to fully comprehend exactly what went on at the crucifixion. I tend to give up after a while and brush it all into an uncomprehensible divine mystery. It’s all very well for me to be able to sweep the bits I can’t comprehend under the rug of “inexplicable divine mysteries” but sometimes I think that particular rug is getting embarrassingly lumpy. I don’t think it’s necessary for my salvation for me to understand Soteriology – or even to know what that means. I do think its important as a Christian to know what I believe and why I believe it. This much I do know: Jesus’ death was both necessary and sufficient to restore our relationship with God. The details are in one of those embarrassing lumps under the rug. I have appreciated over the years to be able to listen to speakers like Steve Graham – Dean of the Christchurch Campus of Laidlaw College (who BTW will be speaking at Westside Church tomorrow morning at 10:30am – *waves to Steve*) who are able to explain doctrine in a way that’s not only easily understood, but also relevant to daily Christian life. The Christian blogsphere needs writers who can do the same, without using Greek, Latin or Jargon.